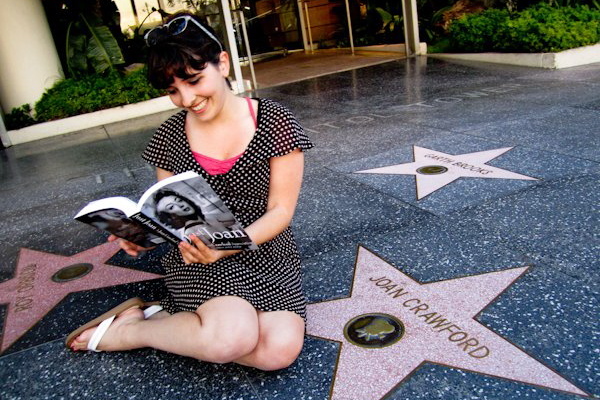 A lovely fan sent me this photo of herself with my book on Joan's star in Grauman's Chinese Theater. Peter Joseph Swanson interviews me for GATHER! 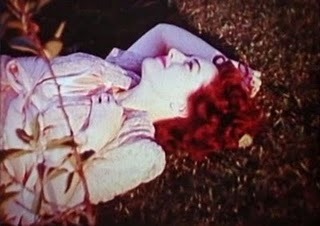 Director William Castle's lovely daughter Terry gives JUST JOAN a plug in her blog! 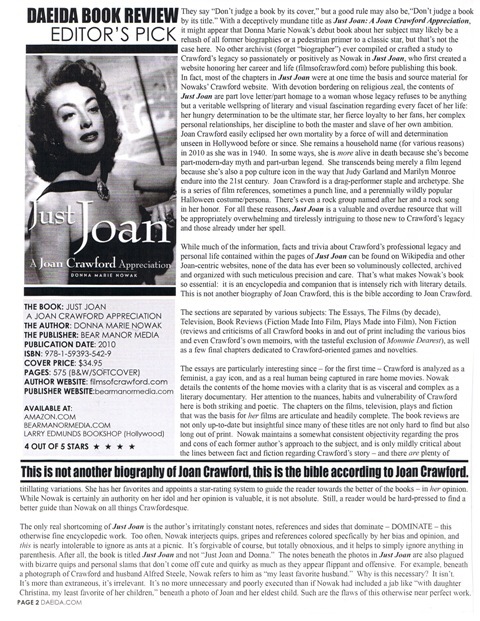 Richard Skipper interviews me and celebrates JUST JOAN: A JOAN CRAWFORD APPRECIATION. Hedda Lettuce plugs our interview and book signing reception at the Chelsea Clearview in her blog! Book signing photos found at above link, folks! Check 'em out! Polish fan holding my book. Love the nail polish. On January 19, 2011, Anne Stone - yes, a different Anne Stone! - of Movie Line International interviewed me on KUSF radio in San Francisco! The ad in Publisher's Weekly can be found here. On March 11, 2011, I appeared on the Derek and Romaine show-- co-hosted by our own Hedda Lettuce -- and I was talking about -- you guessed it - Just Joan and our gal. The station was Sirius 109 and XM 98 and my spot aired 8pm EST. They had call-ins from across the country to ask questions! Book signing at the Stonewall Inn in June, 2011, where Bonnie Dunn, a phenomenal jazz singer, and Gerry Caban, Fosse dancer, performed. On May 20, 2012, I was interviewed by Sonny Starr re JUST JOAN on STARR TALK and it was broadcast at 9:05 PM Pacific. Their guest star was the legendary Gary Puckette, lead singer of the Union Gap. My interview was on segement 3 of the program. It aired over their flagship station KKNX on the West Coast, the net:www.radio84.com worldwide over the Omni Media Networks, and SRN. On June 25, 2012, I was interviewed by the legendary Joe Franklin, a New York institution, a man who has had everyone who's anyone and plenty of up-and-comers on his show (including Barbra Streisand, Woody Allen, Douglas Fairbanks, Jr., etc.) I was very excited to be on the Joe Franklin Show. He's a true icon, the "King of Nostalgia." On December 27, 2013, I appeared on "California Woman 411" (KPTR-AM) with hostess DeeJae Cox in Palm Springs, California. On March 21, 2014 (yes, close to Joan's birthday! ), I will be interviewed on Yesterday USA Radio Networks by Walden Hughes, a radio program that runs out of Texas! 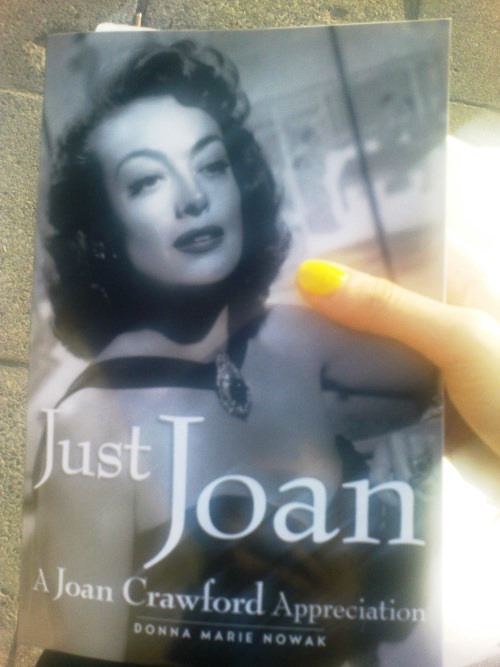 Who else is reading JUST JOAN? Leonard Maltin, Robert Osborne, Jeanine Basinger (who was "thrilled" about JUST JOAN), Janis Ian, to name a few -- and hopefully you!